Looking for high quality dog food for your loyal companion? It is important for your dog to stay healthy and fit. A well-balanced diet is of great importance here. Which type of food you choose depends on various factors such as age, breed, the amount of exercise your dog gets and predispositions to complaints (such as joints issues, obesity, etc.). Does your dog have a condition and therefore require additional support? Diet food can offer this extra support to your pet. It is important that you always first consult your veterinarian about which diet food is most suitable for your four-legged friend. At Vetsend, you will find more than 100 different types of diet food. Examples are diet food that support problems with the urinary tract, joints, liver, intestines, stomach or kidneys. Diet food can also be the right solution for overweight dogs or dogs that need to recover from illness. Take a look at the diet food range of brands such as Specific, Trovet, Royal Canin and Hill's. When your furry friend is healthy, you will of course want to keep it that way. This is why it is important that your dog gets the best dog food possible! At Vetsend you will find a wide range of tasty and high-quality wellness food that is perfectly balanced. This way you know for sure that your dog will get all the important nutrients. 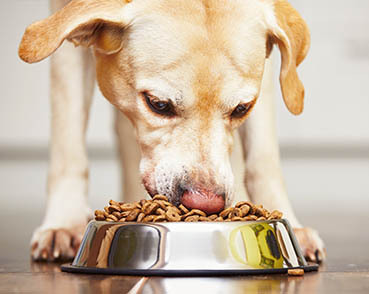 When choosing the right food for your dog, you have to take into account various factors. You can think of the current age of the animal, size of the animal, activity, genetic predisposition for skin, joint or teeth problems and tendency to obesity. This way you can choose dog food that best suits your faithful pooch. Eukanuba dog food is a high quality wellness diet for your dog and can be ordered from our website. Are you conscious in what kind of food you buy and do you increasingly opt for organic products? Now you can also offer your furry friend natural dog food. This dog food is made with respect for nature and animals. In addition, no chemical pesticides or fertilisers are used during the production of ingredients. Famous organic brands are Yarrah, Edgard & Cooper and Schesir! Take a look at our entire range of organic products! Are you looking for tasty dog food that your four-legged friend will surely enjoy? At Vetsend you will find a wide range of maintenance dog food. This food is suitable for healthy and fit dogs, is well balanced and meets the needs of your four-legged friend. Maintenance food is available in different flavours, brands and varieties! Try Farm Food, Acana or Orijen dog food. You will also find dog food that is gluten-, wheat-, and/or grain free. Besides dog food, Vetsend also offers delicious treats and rewards. Because who doesn't love to spoil their dog every now and then? Vetsend has selected special healthy treats for dogs with health issues. These treats are in line with the diet food your dog receives. This way you ensure that your dog is optimally supported. You can choose between tasty chunks, chewy snacks or sausages. Vetsend also has various delicacies for all dogs. Give your dog, for example, a nice chewing bone from Farm Food, tasty chewing strips from VeggieDent or natural treats from Beeztees! There is so much choice, so you can keep surprising your dog every time. Can you only give your dog grain or gluten-free treats? You can find them at Vetsend! Check out the Renske Healthy Rewards or the snacks from Fish4Dogs, Boxby and Braaaf. Vetsend also has fun baking mixes so you can bake delicious treats yourself. This way your dog will be extra grateful.